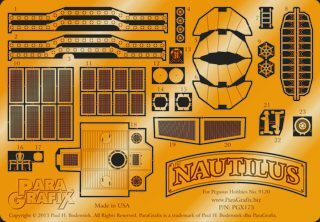 Add all new details and visual interest to the interior of Pegasus Hobbies’ new Nautilus model. Large, well molded windows make the salon a focal point of this excellent kit, and this detail set enhances the already wonderful details. ”Anti-collision” louvers for the salon windows which help cover some “dead” space in the kit. Victorian style arm chair for the desk. Stylized “N” emblem for the pipe organ. Enhanced ceiling beams based on the design of an English Victorian greenhouse. Easy to fold deck and bulkheads with through holes for lighting. A deck hatch that can be displayed open or closed. A ladder leading down into the bowels of the boat. In addition, photoetched hatch handles and open limber holes are included for the exterior.